After last week’s joyful musical extravaganza, this week feels a lot like coming back from vacation to a depressing office job where they don’t let you decorate your cubicle and also refuse to tell you what inter-dimensional pseudo-god is going to kill your girlfriend. And it’s not just the lack of singing and dancing that takes the mood of the whole show down several notches; there’s also the annoying villain of the week, Joe trying to sadly drink away the thoughts of Iris dying, Caitlin making Cisco cry and breaking Julian’s heart with her untimely demise, and the rise of Killer Frost. Our villain for the week is Abra Kadabra, who is a second-place winner of the Large Ham Award for his over-the-top performance. (The perpetual first place winner is, of course, Leonard Snart for everything he is and does.) Abra Kadabra is from the future so he actually uses a lot of futuristic technology, but uses the guise of a magician for... reasons. Everyone learns that it’s not magic almost immediately and it’s not even that high tech in the century where he’s from, so why the magician theme? Why playing cards and inescapable glass tanks? Does he just like the aesthetic of 21st century goth-magicians? Yeah, I’m probably overthinking the themed villainy, but this episode gives me little else to think about, so you can’t blame me. Because Abra Kadabra is not a compelling enough villain to take up a whole episode on his own, without any relation to the long-term story arc of the season, the writers have fluffed up the drama by pitting Gypsy against the team and giving Abra Kadabra knowledge of the Savitar/Iris’s death situation. On the part of Gypsy, she’s determined to get Abra Kadabra for multiple murders on her Earth, including the murder of her former partner. I guess the fact that Gypsy is seeking revenge for someone she loved is supposed to excuse how often she displays absolutely zero sympathy for Team Flash or concern for Iris’s future death, but I don’t really buy it. “Abra Kadabra” is a simple episode that is ruled more by the characters’ moral questions (“is saving Iris right if it means letting this murderer go?”) than action. Abra Kadabra is captured and caged pretty early on, and the secondary chase that happens after Joe opens his cell to question him isn’t all that compelling either, save for the big finale in which Kadabra opens a breach back to the future and ends up getting pulled out of his still-moving spaceship on the way through. Even then, I was more curious about the fate of that ship and whether it crushed any people on the other side of the portal than I was interested in the plot to stop Abra Kadabra. We’re given a very specific either/or situation. Either Kadabra gives up information and goes free, or he gives up nothing and goes with Gypsy. This is completely ignoring a lot of alternative solutions to the problem, not the least of which being the fact that Cisco could make an effort at vibing the truth from him, or they could hook Kedabra up to that psychic magnet machine they used on Joe after Grodd entered his mind, or they could call Earth-38 and get intimidation help from Supergirl — who would probably inform them that intimidation is completely unnecessary because, surprise! J’onn J’onzz can read minds and he can get that info out of Abra Kadabra real quick. But the episode has an incredibly limited framework that its characters can work in, which means that a bunch of geniuses thinking out of the box can’t happen. And that’s frustrating. So the episode unfolds in a predictable manner and Abra Kadabra is taken away by Gypsy without telling anyone anything about Savitar. There is a good little speech from Barry in which he basically begs Abra Kadabra to tell him anyway, which is important because Barry has finally learned not to be smug or gloat in front of villains. The plea to Kadabra’s better nature is also significant because it hints that maybe Barry isn’t trying to save Iris on his own anymore, but then that’s ruined when he decides his next step is to go into the future and see who Savitar is for himself. Barry, how many times do you need to learn not to time travel before that lesson sticks in your dumb Labradoodle brain? “Abra Kadabra” is clumsily handling mysteries with bait-and-switch cliches involving almost getting answers, or raising new questions, or the introduction of new, pointless barriers to the truth. Maybe part of this mystery sleight of hand was on theme with the prestidigitation of Abra Kadabra, but it’s far more likely that it was all just filler. Here’s the problem: The show has a lot of space to fill for their long-term plot and only so many ways to keep the mysteries relevant and present in the episodes without giving away so much that the answers would be obvious to the characters or the audience. They were on the right track with Savitar’s prophecies, which were vague enough to be difficult to figure out and creepy enough to be interesting elements of the mystery, but they’ve run out of steam since then. The result? Episodes like “Abra Kadabra,” which treads water by repeatedly asking all the relevant questions and not giving us anything remotely relevant or new in terms of answers. In stark contrast to the writers fumbling through mysteries and moral questions, Caitlin’s plot — her injury, death, and resurrection as Killer Frost as well as the adorable budding romance with Julian — was straightforward, well-paced, and perfectly acted by everyone involved. Almost to the point where I wonder if dedicating a bit more time to it might have made this episode feel less like pointless filler. 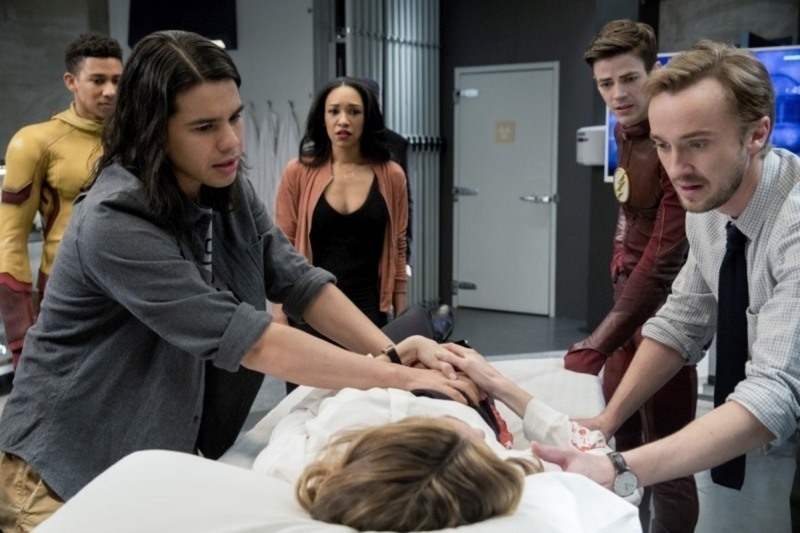 A quick recap: Caitlin is seriously injured during one of Kadabra’s flashy escapes and she could probably heal herself if she allowed her Killer Frost powers to take over, but she doesn’t want to risk it. Instead, she remains conscious and directs Julian through a surgery to remove all the shrapnel from her wound. It’s a success! She survives, everyone’s happy to see her doing well, she and Julian have many Cute Moments™ and it looks like she’ll make it out of this dismal season with just as scar and a story to tell. But then she throws a clot, maybe, and starts flatlining and dies and Cisco is crying, so that’s basically the worst thing ever. Julian rips the anti-Killer Frost necklace off out of desperation to save her, and rather than returning it within the few-second window between Caitlin healing and Killer Frost taking over, they just stare. Killer Frost takes over. What’s worse: whatever part of her might have been the Caitlin Snow they all knew and loved could actually, genuinely be dead. This season has been such a downer. You know what we need? A happy finale. For heaven’s sake, These characters’ lives have been a constant stream of drama and misery for the last three years, show — give them a break. Just one little hiatus-vacation from friends and girlfriends dying, family members dying, time travel blunders, speed gods, murderous people from the future, and impending doom. The most unbelievable thing this show has ever done is imply that anyone can get four free Hamilton tickets. I suspect that Killer Frost might end up one of the main antagonists for next season, since those running the show have promised a non-speedster villain for season four and the team fighting against a former friend would be compelling enough to fuel a longer story arc.